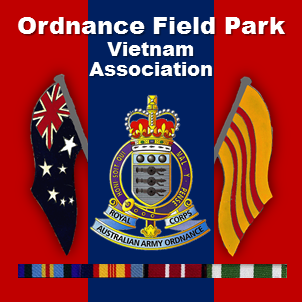 2006 – Hobart TAS – Ordnance Field Park Vietnam Assn. That says it all. We hoped that our 40th Anniversary Reunion would be extra special and it certainly was. It commenced on the evening of Friday 21st April and concluded on the evening of Wednesday 26th April 2006, and was held at the Wrest Point Casino. Hobart. It was well attended with 55 guys and 49 ladies, and with invited guests, a total of 110 for our Reunion Dinner – outstanding. Friday 21st April saw the majority of our group arrive at Wrest Point and the lobby was constantly full of happy faces and welcoming hugs and handshakes with everyone looking forward to ‘our family’ being together again. The opening event of the Reunion was of course the Welcome Reception and the launch of “Our Book” which commenced at 1700hrs. At 1730hrs the formal part of the evening commenced with Tony Flanagan introducing the Deputy Lord Mayor of Hobart, Alderman Eva Ruzicka, to the microphone to welcome everyone to Hobart. Following this, Honorary Colonel RAAOC for Victoria & Tasmania, David Jamison (OC Det 1 OFP 1967/68), made a speech on behalf of the Corps. Bob Nash then proceeded to the microphone to launch our much awaited book. A truly fantastic publication and a credit to its author. A copy of our book was presented to the Deputy Lord Mayor, and special presentations were made to two of our widows, Jan Stonehouse and Amy Chambers. With the formalities concluded, the best was yet to come. The room suddenly filled with Robin Williams famous “Good Morning Vietnam” and the sound of helicopters overhead – the room went silent for a moment as the ‘slide show’ lit up the hugh screen. Everyone seemed to be spellbound by the sight of the young men of the OFP in Vietnam – lump in the throat material!! Before the evening ended, as a special souvenir of the 40th Anniversary Reunion, each of the guys who attended the Reunion were given a boxed set of two engraved wine glasses This was made possible by way of a grant obtained from the Department of Veterans Affairs under their Commemorative Grants Programme, “Saluting Their service”. Saturday 22nd – We boarder our coaches at 0915hrs for a run to the top of Mt Wellington. Brrr! Absolutely freezing, but the view was spectacular. We then headed back down the mountain to Salamanca Markets, where most of us headed straight for a hot coffee before soaking up the atmosphere of Hobart’s famous markets. The afternoon was free to browse and head back to Wrest Point at our leisure. Saturday evening saw everyone gather in the Derwent Room at 1900hrs for our Reunion Dinner Dance. The buffet meal was first class and the dessert buffet spectacular – well done Wrest Point. Because of the special nature of this year’s reunion we opted for live music instead of a DJ. This proved to be a great hit. All in all the night was a great success. Sunday 23rd – 0945hrs – What a hardy crew!! Despite the previous nights activities everyone was on time to board our coaches to go to Tahune Air Walk near Geeveston, about a hour and half trip. A BBQ lunch was provided whilst we were there. Monday 24th – 0815hrs – Everyone on time again! A full day lay ahead of us starting with the coach trip to the historic Richmond, with an hour to explore the town. We then headed off to the Fox & Hound, a beautiful Tudor style pub just beforePort Arthur, for a delicious buffet lunch. After lunch we headed on to Port Arthur for a look around for a couple of hours. Included was a twenty minute harbour cruise. We arrived back home about 1730hrs. Tuesday 25th – Anzac Day – Our coaches picked us up at 0930hrs to take us to our marshalling area in town. The ladies were taken to Cenotaph where the march was to end. The march finally got under way at 1100hrs. Our unit was ably led by Alan Davis (2IC – 1 OFP 1969). Our banner bearers were John Faram and Bill Dobson, and John Galpin and Terry Buchannan carried our wreath. As always our group was impressive and our banner again stood out as a highlight of the parade. Following the services at the Cenotaph, our coaches were waiting to take us to the Queens Head Hotel, North Hobart, for drinks and lunch. Everyone was back at Wrest Point by 1700hrs for our BBQ which started at 1800hrs. A nice end to a great day. Wednesday 26th – 0900hrs – Our cruise boat picked us up from Wrest Point jetty and we made our way up the harbour, having coffee/tea and scones on the way. Coaches were waiting at Morilla Estate Winery to take us all to Cadbury’s for our tour. Some two hours later we boarded our coaches, along with mountains of chocolate, and headed back to Morilla to catch the cruise boat back to Wrest Point. Around 1900hrs we all gathered in the Sports Bar at Wrest Point, money was put over the bar and everyone quickly came to the realisation that our time together was once again drawing to a close. As 2200hrs rolled by farewells began, hugs and handshakes again the order of the day with a promise to keep the reunions alive and the friendships formed between both the guys and girls cemented forever.